When I was a child, I dreamt of America: of revolutionaries and cowboys. I dreamt of brave men conquering the wild frontier, battling their way westward toward the ocean to achieve the natural destiny that God laid before them. As an adolescent I dreamt of the savages and the slaves in the field, cumulus clouds bending over their backs. I dreamt of the war between brothers, and the glory of the southern cause. I celebrated abolition and the great march toward freedom, equal rights for blacks, not realizing my hypocrisy. I lived in the world of fantasy - of white picket fences and suburban cul-de-sacs. But only in my slumber. I did not know that all my life I dreamt white dreams - the dreams of white men. It was my legacy for the taking, and the wealth of the American dream was for me, but it was not for the blacks, or the Indians, it was not the legacy of women. No, it was built upon their backs. It is only now that I can begin to understand it myself. What profound romanticism in what we aspire to be, and such tragedy in what we are! America is a pantheon of martyrs. It is the illicit seduction, the taboo, the forbidden. The American Dream is a warm gun. Though I do not claim to entirely understand experiences I have not had, I have witnessed my share of tragedy, violence, and injustice; manifest in school shootings, drugs, abuse, and death. But what I do understand is that human suffering is comprehensible to all of our species and through empathy we may know the hearts of others if not their memories. America is not whole. It is entirely impossible to understand it without understanding the profound scars of our history, without understanding that invisible wound that divides our country between the north and south, between the urban and rural, between empowered and the powerless, which we seem unable to dress and heal. Though in my work I seek answers, I do not presume to answer them myself. The best I can hope is to contribute more nuanced questions. I believe that art can affect the direction of culture. It can inspire more constructive dialogue through distilling and re-contextualizing our most divisive challenges to reveal new perspectives and transformative experiences. 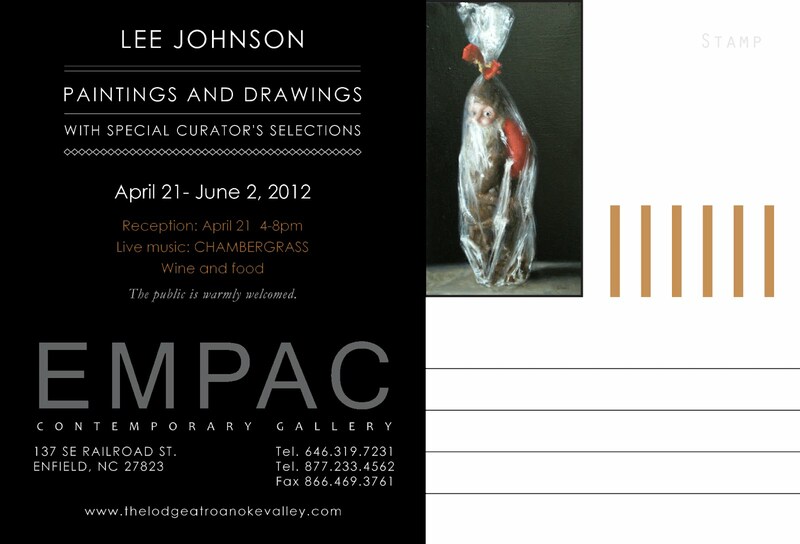 This body of work marks the path of my search, the half remembered phantoms of awakening. It follows my questioning, both those that lead to fertile fields of understanding and those that lead to dead-ends. I hope that you'll find it as enlightening as I. Perhaps that was, is, the hope of the movement: to awaken the Dreamers, to rouse them to the facts of what their need to be white, to talk like they are white, to think that they are white, which is to think that they are beyond the design flaws of humanity, has done to the world. But you cannot arrange your life around them and the small chance of the Dreamers coming into consciousness. Our moment is too brief. Our bodies are too precious. -- Ta-Nehisi Coates, Between the World and Me. As a child I loved to take things apart to figure out the marvelous mechanisms by which they functioned. I would often summer at my grandparents’ house in Alabama, and I recall being fascinated by their beautiful antique clock. One day, when my grandfather left for work, my grandmother went to run errands, and for the first time I found myself all alone with the clock! Today, I decided, would be the day that I tackle it. Hours later, there I sat with the clock disassembled - the cogs and springs scattered across the floor, and I realized that my grandmother would return any minute now, and if I didn't put it back together, I was in for big trouble! Somehow, I managed to reassemble it, and it functioned... more or less. Though my grandfather remarked with curiosity that it never quite told time as well as it had before. I never told them about this, but if I had, many years later, I don’t think they would have been too angry. In retrospect, that’s just what people do when they’re trying to understand something. Of course, now I realize I could have consulted a book, or found a less valuable clock to disassemble - perhaps one that wasn’t a family heirloom. I wasn’t the first to take a clock apart and I won’t be the last. But, there is some experiential value in finding out for yourself. Asking questions is a fundamental part of learning and learning how to ask the right question is ever more beneficial. But what happens when all we do is question without the formidable task of formulating answers? A life of only questioning doesn't allow for the building and passing on of knowledge. Given the brevity of life, we don't have time to re-invent the wheel every single time. How would we build a chariot, a wagon, a car? It was arguably necessary to question the cultural assumptions of the aristocratic 19th century: slavery, gender prejudice, colonialism... but there were necessary values which were also thrown into the rubbish pile such as beauty, truth, skill, and a belief that humanity can better itself, that we can transcend our greed. And early modernism began in this vein, but after the atrocities of two world wars, many of the culturally influential in academia and the art world lost faith in our better selves, precipitating the relativism of Post Modernism to the market driven Contemporary Art. In a nutshell, Contemporary Art is chiefly concerned with questioning, Post Contemporary proposes answers. Art historians define “Contemporary Art” differently than the dictionary. In art historical terms, “Modern Art" and “Contemporary Art" do not mean “art made now”. Modern art is largely abstract art made in the first half of the 20th century. Likewise, “Contemporary art” is art made in the latter half of the 20th century and is characterized by Post Modern ideas - that is, it emphasizes the transient and often superficial issues of the present moment. Both emphasize a critique of the Classical fine art tradition and classical values such as quality, beauty, and skill. Post Contemporary philosophy proposes that the art experience is universal to humanity, and that this experience can inspire healing, and transformation. So, what distinguished Post Contemporary art from Contemporary realism? Being a painter myself, I'll focus my analysis on what I know best, that is: painting. I'll leave other art forms to those who have more expertise in their practice. The first painting above "Ship of Fools" by Carl Dobsky, is an example of a Post Contemporary painting. The second, entitled "The Old Fence" by John Currin, is an example of a painting that lies more in the category of Post Modern figuration. "Ship of Fools" asks as many questions as it answers, yet its expression is built upon a belief in the baseline of the universal human condition. One man bails out the ship with a small bucket, while the whole craft lurches frighteningly close to sharp rocks, ornamented with the wreckage of previous ships. A reminder of the past, or a premonition of the future? While he presents the folly of mankind's foolish pursuit of beauty and truth into treacherous waters, we can't help but see this gesture as somehow heroic. For this swarm of butterflies, cascading into the maritime nocturne is an unusual occurrence, perhaps the focus of a zoological investigation? The dramatic baroque light, the Boschian expressions of madness and passion, demand that the viewer inquire deeper than the initial impression of humor. Does this not reflect our own search, each of us, to capture the ephemeral, the rare? Pushing the limits of our understanding requires braving ever greater dangers. Though it may seem that the life of a painter cannot be compared to the intrepid explorer, the astronaut - there are unexpected dangers and sacrifice in the life of the artist, there are murky depths into which we sail, distant from the shores of the people we love, and there we can sometimes lose ourselves in our passion, in our madness. While I sincerely enjoy Currin's painting, I find it very much locked into the perceived zeitgeist of the time in which it was created. 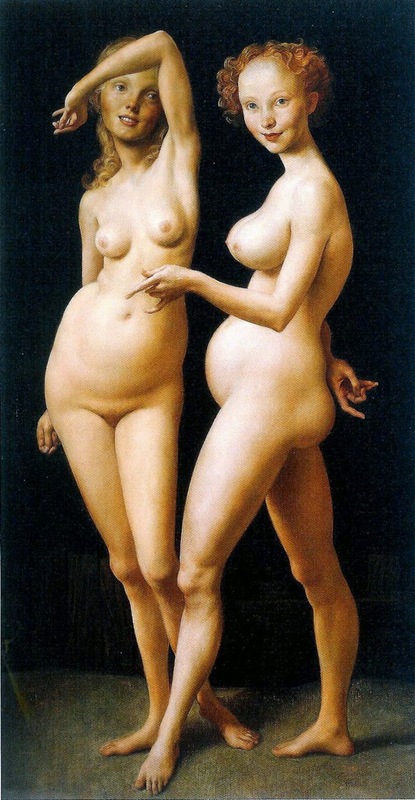 Currin's figures, with their fleshy rendering somewhere between a Cranach and a cartoon are painted with a modicum of skill - yet they are suggestive of playfully grotesque fashion models of the late 90's. His use of classical painting techniques and a hint of grace and beauty might make this work Post Contemporary, save for the fact that their use is rather tongue in cheek, which you can read in the expressions of the figures, the discord between the murky face of the woman on the left and the rest of the painting, and by observing the rest of Currin's work. His use of the European Fine Art Tradition is ironic, he has assembled this construction only to shoot holes in it and bombast the frivolity of art. This work is meant to be read through a post modern, linguistic lens, the technique and the figures are signifiers of an outside context, rather than expressing their meaning through the visual language of painting, mark making, and composition itself - what Vincent Desiderio calls "The Technical Narrative". Dobsky's, and Adam Miller's work "Twilight in Arcadia" are excellent examples of a Post Contemporary use of this technical narrative to convey meaning that transcends the time in which they were created. They speak to us today, not because they present figures dressed in clothing we are familiar with, but because they aspire to speak to every human being about eternal human conditions across every era and every culture. 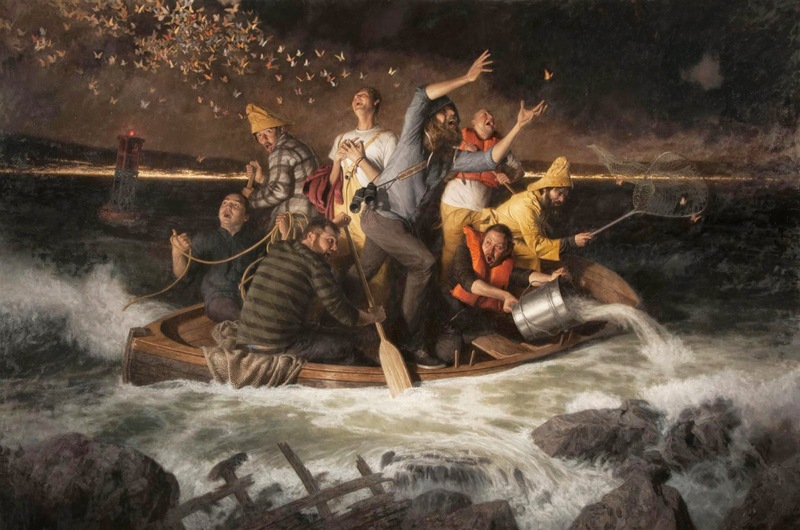 While Currin's work requires a textual analysis to communicate its deeper meaning, "Ship of Fools" and "Twilight" are self evident. They do not beat you over the head with their message, yet they are more and more intelligible the more time one spends before them in contemplation. Instead of trying to change the minds of Art historians to include our work in the museums that house Contemporary Art, Post Contemporary offers an alternative form where classical values are acceptable, one need not reflect one’s time to be relevant, and quality is more important than novelty. That isn't to say that one mustn't reflect one's time, nor that novelty has no value in Post Contemporary philosophy. PoCo does not view art history as a single line of progress, as Contemporary art views it, but a branching path, where many different approaches can co-exist in a pluralist art culture. Artists still make modern art today. Artists will still make contemporary art tomorrow. But now there is a place for artists who make work that expresses coherent ideas through a visual language, rather than through a text. Questioning is valuable and will always be an integral part of what the artist is here to do. And I would argue, to the chagrin of some of my dear colleagues, that Duchamp's urinal, which inquired into the very definition of art itself, was an excellent line of inquiry. However, the same interrogation has been repeated for nearly a hundred years now, and questioning alone forces us into a feedback loop, which the Italian poet Primo Levi describes as "the unstoppable and cyclical rebirth of the 'modernist' rhetoric". In the course of a day, most of us don't have much time to reflect upon the deeper reasons why we do what we do. We act and react to countless events, and relying upon our instincts is often the most expedient way of getting through the day. But there are times when what we're doing isn't yielding the results we desire. If the goal of art is to have a positive impact on culture, such is the state of the market driven Contemporary Art world. We have asked a century worth of questions... some productive, some not. We have questioned our assumptions and the very foundations of our reality. But what has not been embraced thus far in the art world, is the attempt to formulate new answers. Now we have the opportunity to move forward, to blaze new territories, but in order to succeed, we must abandon the century old battle between the classical tradition and the contemporary art world... between the questions and the answers. Why not embrace what each of us do best and build a dialogue between the two worlds? We have learned the mysterious inner workings of the clock, now let us embark together to build a better one. Together we might learn to ask better questions, and perhaps we might find a few answers. Post Contemporary is not owned or originated by any one individual. Though, I am to blame for introducing the term to the world of painting, I do not propose to be the founder. I am merely trying to describe what I see already developing around me. PoCo emphasizes empathy for all, regardless of gender, race, sexual orientation, or creed. PoCo is not a movement, but an aesthetic philosophy within which many movements may take place - like modernism and post-modernism before it. PoCo values are not only expressed through the work of painters, but also in sculpture, architecture, literature, and film. June 2014, the Norwegian Supreme court sentenced Odd Nerdrum to one year in prison concerning allegations of gross tax fraud. I am no longer shocked but am continually outraged, as this is the third and final sentence regarding this case. I won't discuss the details included in the article below. But, I will tell you the facts behind the case, which have been repeatedly overlooked and mis-represented in the Norwegian press. 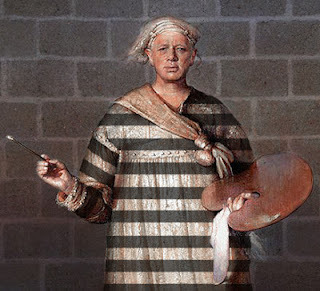 First of all, it is crucial to understand that according to the current Norwegian laws, Odd Nerdrum will not be allowed to paint in prison, as prisoners shall not engage in "commercial activities" while serving their sentence. Even if the sentence were just, this would amount to nothing less than cruel and unusual punishment, a violation of human rights, and not least of all, a violation of his freedom of expression. Though we in the United States highly value the freedom of expression as a universal and natural born human right and fundamentally necessary to the fabric of a free society, many nations such as Norway do not seem to hold the same belief. Further, we have ideals about justice, that the defendant is "innocent until proven guilty" and that it is first the responsibility of the prosecution to provide evidence of guilt, not the responsibility of the accused to provide evidence of innocence. These principles were clearly violated from the first to the last as each court presumed Nerdrum to be guilty from the beginning and demanded that he prove his innocence. These proceedings remind me more of the Spanish Inquisition than they do of a modern judicial system in the civilized world! Clearly the Norwegian judicial system doesn't operate according to the principles that we believe are universal. So, though I can not claim that this sentence violates any Norwegian laws, I will say that this sentence violates international laws on human rights and self evident principles of justice. It began when approximately 40 large scale pieces that Nerdrum painted with an experimental medium began to drip and melt. Understandably, the collectors who had purchased these paintings were upset. Nerdrum spent the next decade re-painting many of these pieces and offered to ship them at his expense to the collectors. The Norwegian IRS claimed that he painted these pieces, not to replace the damaged paintings, but to sell them and evade paying taxes. Here is the full article in the Norwegian Press below. The High Court has taken the matter to the earth. They have reduced the amount Nerdrum was previously convicted of dramatic, says defender John Christian Elden NRK. - On the one year and eight months as they now have imposed, then eight months suspended, so they have said that he shall serve one year in prison, continues Elden. 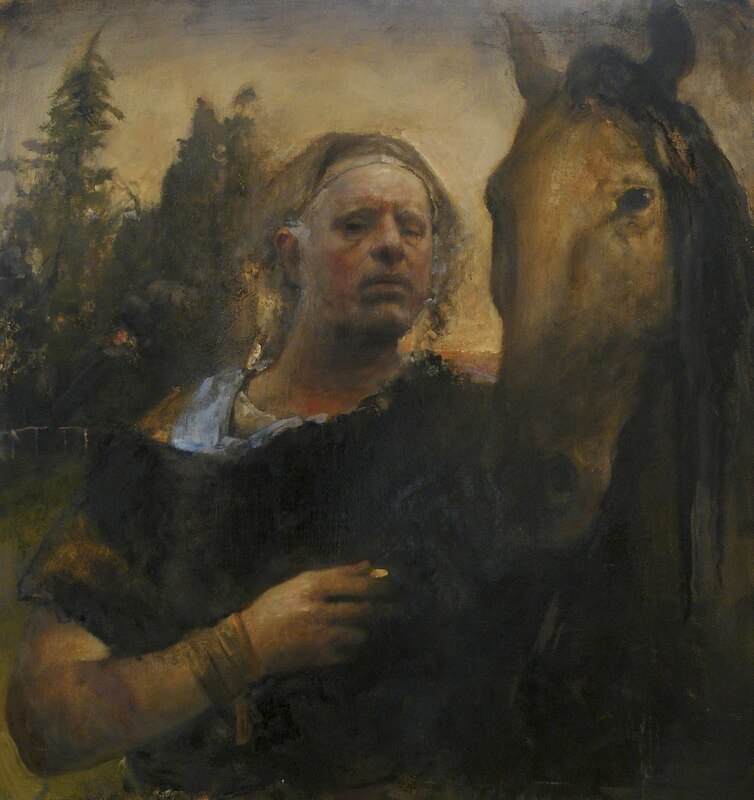 In the Court of Appeal on 23 May let the prosecutor and the acting Attorney Asbjørg Lykkjen claim for two years and ten months imprisonment for artist Odd Nerdrum (70). The case was in May reprocessed in the High Court. Odd Nerdrum arrived appeal the Court of Appeal with his attorney John Christian Elden in mid-May. In June 2012, Nerdrum sentenced in the High Court to have sold pictures of almost 14 million without bringing up income on your tax return.The artist was sentenced to two years and ten months. Nerdrum appealed to the Supreme Court, which overturned the verdict because they believed the judgment of the Court of Appeal was inadequate.Thus, the whole matter is discussed again by the Court of Appeal in May 2013. Defender John Christian Elden asked the High Court to acquit, and that if Nedrum was found guilty, he should be imposed mildest possible punishment. During his closing argument the Court of Appeal, he criticized the investigation in the case. - There has not been one question from the police to me during the years I have been defending. When the police can not stand afterwards and say that defense should come with more. It is a fundamental failure of an investigation, said Elden in the Court of Appeal on 23 May. 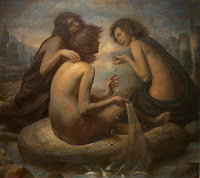 Odd Nerdrum has even said that tax evasion is due to his own mess, and no ill will. - I had little knowledge of these checks. Had them in your pocket. Forgot them. Had to get new ones. 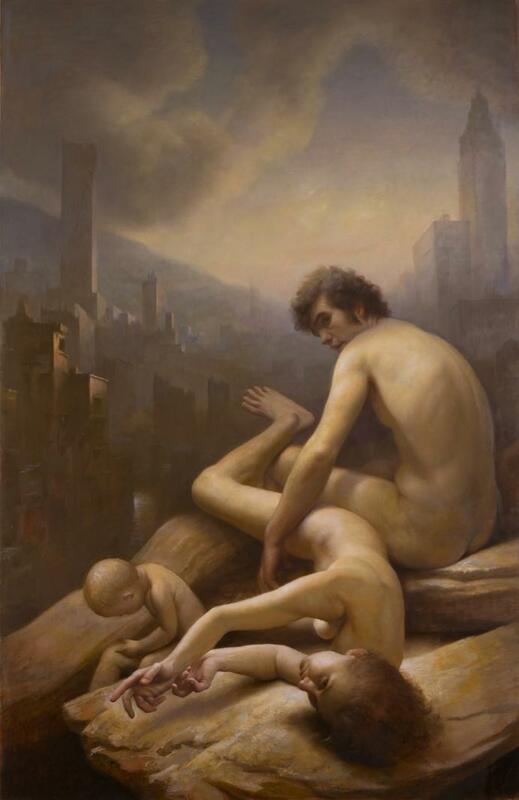 So hopeless I explained Nerdrum in court. Odd Nerdrum has two parallel cases going to the courts. The artist has brought a case against the Norwegian tax because he believes himself falsely imitated for years 1998-2002 and would have repealed the decision of the Tax Office. He lost the case in both the District Court and High Court and appealed the case to the Supreme Court in May. Last February, I visited Denver for the first time for the purpose of filming an instructional drawing course. Responding to dozens of requests, I've tried several times to produce one myself, but simply couldn't resolve a high enough production quality with my limited resources and still offer an affordable price. This is where Craftsy.com came in. Not only did their production team have all the bells and whistles, but they also were spectacular at their job. Even so, we were able to make it affordable - even on a student's budget. In seven sessions that you can follow at your own pace, my course Expressive Figure Drawing, covers techniques for expressing emotion, mood, and concepts utilizing the language of mark making and composition. 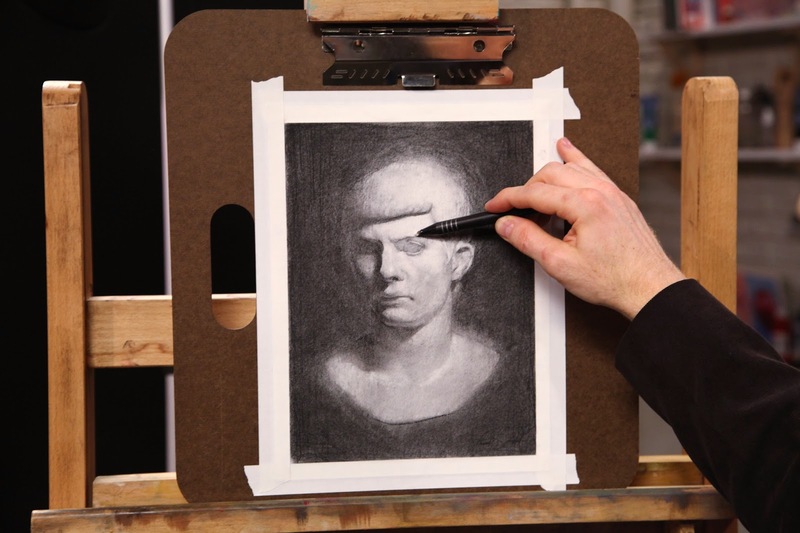 I discuss examples from the Old Masters, and a few new ones, as well as demonstrate several drawing approaches, including charcoal and chalk on toned paper, reductive charcoal drawing, and a secret bonus technique you won't learn anywhere else. Better yet, for my readers, I'm going to give you 50% off my class if you sign up before April 15th. Just follow this link to my class: Expressive Figure Drawing. 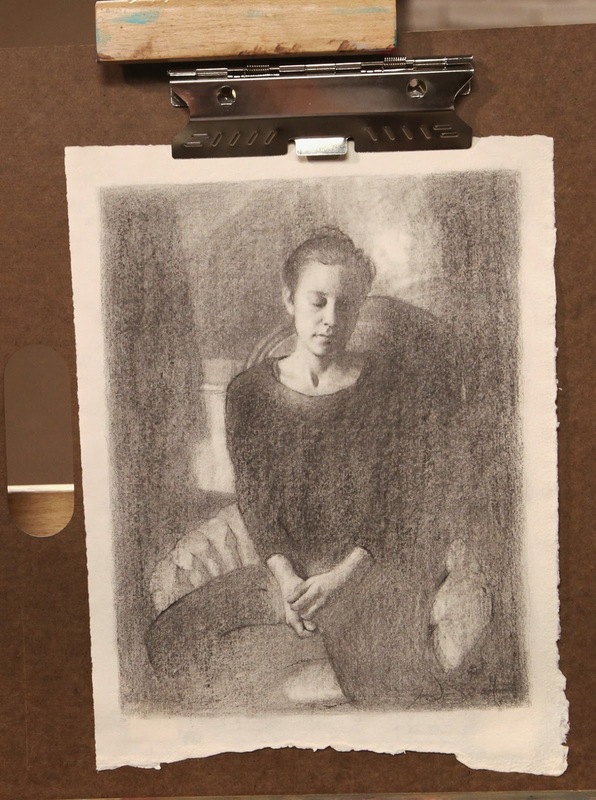 This course will be a one day intermediate portrait workshop, covering classical skills from the old masters to contemporary masters: materials, techniques, and philosophy of drawing. Beginners welcome! Work in any media you feel comfortable! 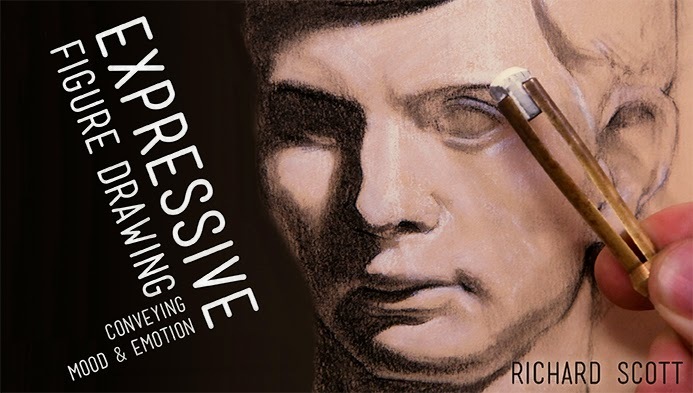 Richard will walk you through the stages of composing and beginning a portrait, starting with compositional skills, drawing and proportion, light and form, and finally evaluation. There will be helpful information on how to analyze your work in order to improve both your skills and give yourself the tools to express your vision. The focus of this course will be on drawing techniques, with the goal of utilizing observed phenomena in order to explore rhythm, emotion, and both the expression of the model and your expression. It will cover adaptive methods for utilizing the movement of the model, compositional changes due to your decision making, and enhancing both analytical and intuitive approaches to drawing. Emphasis will be on balancing the detailed and accurate observation of light, form and anatomy - with composition and expression. Civilizations, like the cycle of life and death; grow, flourish, mature and decay. This is as true for every being as it is for entire cultures. Among the Ruins is an unflinching meditation upon the plight of the nuclear family in a post-industrial world. Equally disturbing and emotively driven, these works seem to breath vision into the eloquent and sightless verbal wasteland of Cormac McCarthy’s The Road. In this body of work, Miller reflects upon the ruins of a concrete empire, following the collapse of the machinery of State. Stunning in scope, his mechanized wilderness is populated by effigies who draw their only nourishment from their love of each other. The new hope embodied by their children is emphasized in a conceptual contraposto, silhouetted against the corpse of the urban jungle. Yet, as the darkest day of winter is also the beginning of the sun's return, these families are the first to begin rebuilding their society and sewing the seeds of bright and distant future. In an era, entombed by the collapsed modern-industrial complex of the twentieth century, not unlike the collapse of Classical Europe after WWI, we can reflect upon what has passed, while envisioning the ground plowed before us, fertile and receptive to germinate a new way of life. Read as a whole, this body of work tells a compelling narrative of renewal, rebirth, regeneration - in which the best natures of man, and the natural world might return to harmony and balance... but ultimately, the end of this story is left up to the viewer. Sign the Petition to Free Odd Nerdrum! It is with a heavy heart that I tell you of the escalating persecution of my dear friend and mentor. A man who has demonstrated his honor, has freely given his knowledge to thousands of students, has been a champion for human empathy and integrity, who generously gave my wife and I a chance to begin our lives anew when we lost everything in the great recession... this man is the first political prisoner in Europe since World War II. To some, this statement may be not be surprising, to others it may seem shocking. It may at first seem an exaggeration, but I ask you only to honestly consider the facts of the case and come to your own conclusion. Odd Nerdrum has been given an increased sentence of two years ten months by the Norwegian Appeals court concerning allegations of gross tax fraud. He will not be allowed to paint in prison, as this is considered a "commercial activity". I can only conclude that the reason for his increased sentence is punitive - a retaliation for Nerdrum appealing the verdict of the district court back in August 2011. 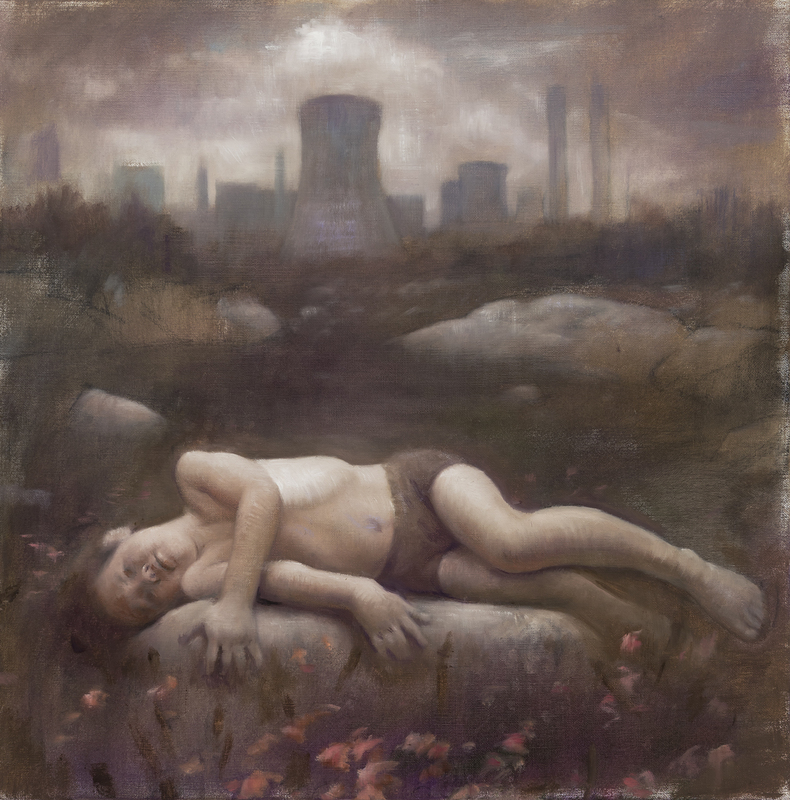 It's profoundly important to point out that Nerdrum's paintings are not merely a commercial activity, they are an exercise in freedom of speech. Nerdrum has been known for challenging the status quo for decades with his paintings and statements; the very nature of his work contradicts the dominant Norwegian art world (largely funded by the Norwegian Government), and even the "social democratic" policies of the ruling Norwegian Labor party (see faceless society video below). He stands out as an individual, questions authority, has been censored on television for directly criticizing the Labor Party, who also dominates the Norwegian Judicial system. As such, the court's attempt to silence him amounts to nothing less than the repression of political speech. What appears at first to be a run of the mill tax evasion, soon reveals itself to the inquisitive to be nothing less than political persecution and a violation of human rights. The Norwegian Appeals court has taken it upon themselves to stifle the freedom of speech. Moreover, they have convicted a man based upon conjecture, inflated numbers, and faulty logic, and without concrete evidence. Innocence until proven guilty, beyond a reasonable doubt, is a basic premise for any just court. And both the Norwegian district and the appeals courts have violated this premise. It may or may not surprise you that the Norwegian judicial system has been convicted multiple times by the European Court of Human Rights for violating the principle of "Innocent until proven guilty". The Nerdrum Affair has been a confusing case for many people. Different sources seem to give different numbers: even the courts can't seem to agree with the IRS or each other. So, I've taken it upon myself to collect and condense what I view to be the pertinent information all in one place. I've given you my opinion, but ultimately, you'll have to come to your own conclusion. (From the article below: Forum Gallery, as the exclusive gallery for Nerdrum worldwide, has sold paintings worth of $1,486,000. This number has been confirmed by American Tax Authorities, says Nerdrum's defence lawyer Berg. This is way below the $2,349,000 Odd has been sentenced for evading). A little background on Norwegian Politics. Betty Lou Totten in Florida, Leo Neufeld in New Mexico, and Charles Cecil in Florence. Tell us about your training? What is the process in an atelier or teaching studio as opposed to a university art education? The atelier training is pretty much nuts and bolts, just about how you build an image and develop craft. We worked 6 to 8 hours a day drawing from the cast and the model. This training typically takes 3 to 4 years of solid study. In atelier training there is no vaporing about complex theories, or anything that isn’t germane to the painting process. By contrast, university art education emphasizes that it’s more important how you talk about art than how you make it, trying to teach artists to think like art critics, instead of art makers. What is the chief benefit of such training? It keeps you very image-focused, establishing the primacy of the visual over the conceptual. It also lets you get really deep into your own work, to explore how far you can take a painting. And, if you’re lucky, you get to work with some really accomplished people. Besides your teachers, what painters have influenced your work? There’s the big names, Velazquez, Sargent, Tiepolo, Goya, Ribera, as well as illustrators like Pyle, N.C. Wyeth, Kliban, Gorey, and John R. Neill. What is your philosophy of painting? I don’t know that I have one, not in so many words. I’m a really visual person, so I suppose that a strong visual sense combined with a good imagination and a sense of humor is what I rely on. How many hours a week do you paint? Probably no painter ever thinks he works enough. I paint as often as I can, but it really varies depending on what I’m working on. I can bang away at a canvas for hours and hours a day and not get much accomplished, and sometimes I can just work for thirty minutes and finish a painting. Would you describe your working methods? I start with small drawings from my imagination, fiddle with them a bit, then get models in to work out the poses and do more complete drawings from life. At this stage I also do tone and color studies for the final composition on wax paper. This gives me the materials to begin work on what will be the final painting. I rough in the composition, bring the models back, and start to build the painting. From there it can be fast or slow depending on the painting, but in general I’m a really slow painter. My ideas tend to start very fast, but take a long time to develop, and I will often scrape out large parts of paintings if they are not working, and start again, much to the frustration of my models. I also spend a lot of time just looking, and not painting, in order to understand the direction a painting needs develop. What are your views on the application of paint? Whatever works. I think a lot of painters indulge in a bit too much cork-sniffing about paint handling and painting mediums, etc. The solution to getting good paint quality is often to just to use enough paint. Do you paint outdoors often? Not as often as I’d like. I go through phases where I’m doing a lot of plein air stuff, and then periods when that is not at all what I’m into. Painting outdoors is really important, though; it’s like a vitamin for your color use. What are your favorite subjects and materials? Figures, figures, figures. I’m only really interested in images with figures in them, so I rely heavily on live models. As far as media, pencil and charcoal for drawing, and oil for painting. What is the role of talent in painting? Not really sure about that. I’ve known “talented” and “not-so-talented” people, and while raw ability can give you a boost in the beginning, it really comes down to a willingness to work, just like anything else. I’ve also seen plenty of “talented” painters who crank out boring, awful paintings. What is the role of style in painting? Style is really something you can’t help having, sort of like a voice. Sure, you can deliberately choose a style I suppose, but that may only be an affectation if it isn’t something that grows naturally out of what you love. Those types of labels can be really limiting too, and when people pigeon-hole an artist’s style, they tend not to look as much, since they’ve already got a term defining how they should think about that artist. I like to leave some things unresolved; it gives the viewer something to do. Betty Lou used to say, “Don’t tell the world everything you know.” If you “finish” every little thing, the painting can become a boring iteration of fussy details. I have an old guitar I like to mess around with, and will plug in and crank up the amp in my studio when I need a break from painting. This is also when I do a lot of staring at the paintings. Again, figurative work is my favorite, and I will gravitate to it no matter the medium. What are the most important qualities for an aspiring painter? I don’t know about qualities, but I tell people who want to learn to paint to find a painter who’s work they admire and try to study with him, or with the guy who taught him. And it’s an old adage, but drawing really is the cornerstone of painting, something you can’t do enough of. You can also learn an amazing amount by copying paintings, ideally from the real thing, or from reproductions. In a dramatic turn of events, the internationally renowned painter Odd Nerdrum has been granted a new trial in the Norwegian appeals court. His two year prison sentence has been overturned amid growing allegations of faulty evidence and infractions of the legal process during the trial. Because his prison sentence was less than six years, the probability of being granted an appeal in Norway is incredibly low. Thus, the choice to overturn the sentence requires serious concerns about the district court's verdict. 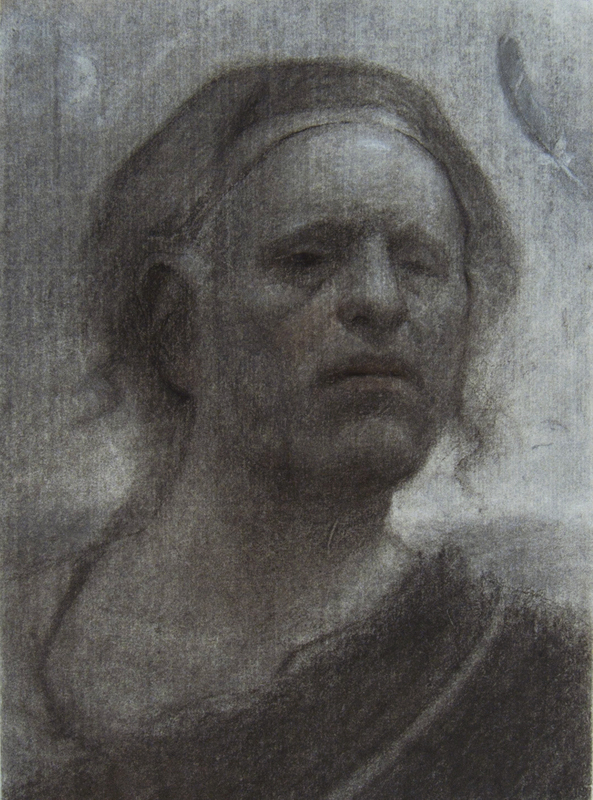 The appeals court stated that it specifically wanted to review questions over a sum of $300,000 taxed in Iceland in 2003, as well as to re-consider Nerdrum's explanation that this fiasco began due to some 40 paintings that had melted due to experimental techniques. The date of the new trial has not yet been set. To all those who have supported Odd Nerdrum during this trying time, thank you! Our efforts have been successful! Thank you to Michael Gormley and Allison Mallafronte for publishing The Nerdrum Affair in American Artist Magazine! I truly believe you have played an influential role in securing a fair trial for Odd Nerdrum. Thank you to Brandon Kralik, Alexey Steele, and Otto Rapp for your great efforts to make this case visible. And last, but not least, thank you Bork and Ode Nerdrum for doing such a great job with freeoddnerdrum.com! Jean-Daniel responded by sharing this fascinating article entitled "How does the Brain Perceive Art?". It discusses a study conducted at Oxford University, which concluded that brains can't tell the difference between a real Rembrandt and a fake. They tried to gauge the response of viewers of both Rembrandt paintings, and students of Rembrandt, with the goal of testing this very question. 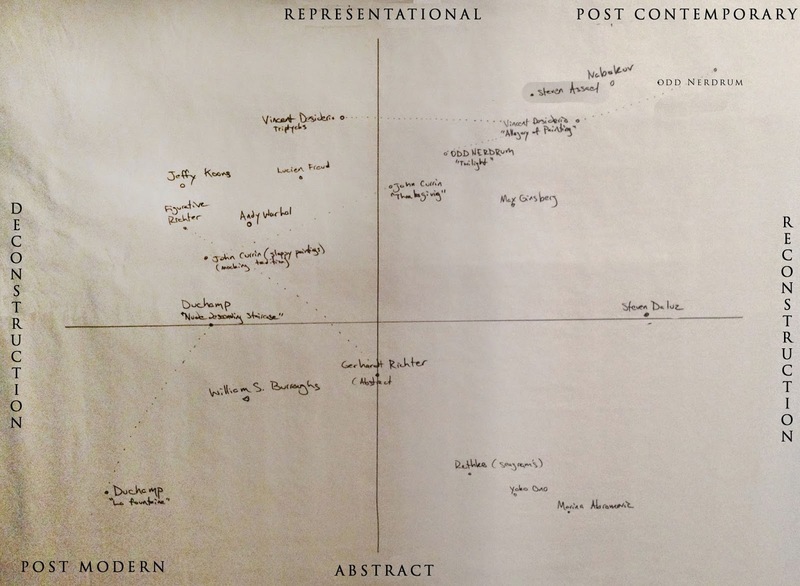 Just how subjective or objective is our aesthetic experience? It addresses a question I've posed many times before: does it matter if "the Polish Rider" is a real Rembrandt, or a student? Is it not a masterpiece either way? Before we go on, I have to point out that they only included 14 participants in this study, all of whom had no education in Art history nor any education in life drawing... so we can't really say that this study is conclusive, as it includes too few people and does not have a sufficient cross-section of people. "I guess the question is whether you consider the physical object to be the truth, or the flawed perception of the observer to be the truth. Was the consensus correct when they believed that the world was flat? It just goes to show how influenced people are by false illusions. But, this all goes back to whether you believe the theosophy of Plato, or the scientific objectivity of Aristotle, or the irrational rhetorical tricks of the sophists. That's what we're really debating here! Plato, or Aristotle, or the pre-Socratic sophists (in the case that you follow Hegel instead of Kant). As a representational painter, I have many years of training to be able to see what's actually there in front of me instead of the symbol or illusion of what people say is there. This is the only way you can paint representational work. Of course you have to be able to project your vision onto the reality. This is more interesting... but you have to be able to discern the difference between reality and a dream, in order to make such a work. More than a century ago, art critics, historians, and the art viewing public all had studio practice in drawing and painting to some extent, so they all had some ability to see what's in front of them and form their own conclusions. So, this is perhaps the reason that today, they only follow the false illusions of fashion. So, one can say that this is simply the way it is, this is the way the world works... and that I'm describing the way it "should be". One can conclude that it is very naive, or very arrogant of me to say that it should be any other way than it is. Who am I to say that the world is round? I don't know who " I am" in that sense... I don't know who it is that gives one the right to think for themselves, and relegates other people to the crowd of sheep, but I'm sure history will sort it all out for us. As for today, I can't accept "the way things are" and sacrifice the very fibre of my individuality to mass delusion. No, I must say again that the world is a sphere and is not flat. 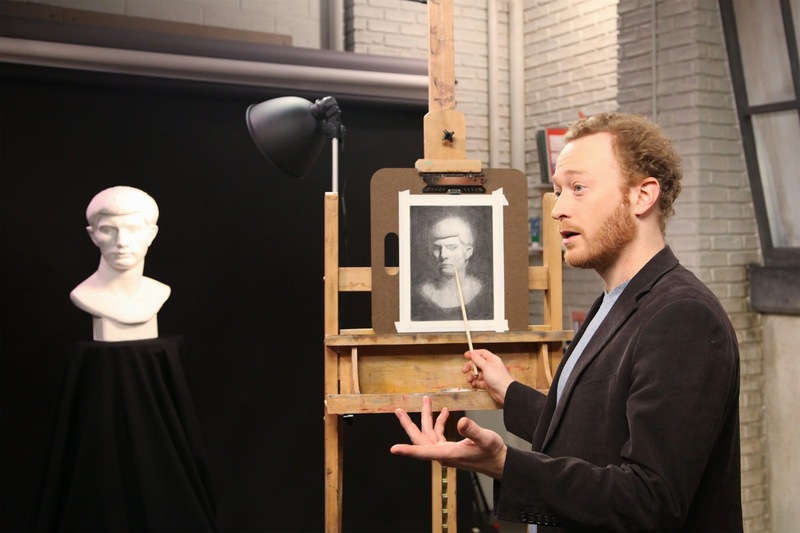 But you asked an interesting question the other night: why paint like Rembrandt today? Well, why not paint "like Rembrandt", if you like? This is something Odd and I have discussed extensively. You could ask the same question about any modern painter or artist. Why paint like Francis Bacon, or Otto Dix, or De Kooning, or Koons, or Hirst, or Picasso? Yet most contemporary artists do. Those who know art history can see that 99.9% of contemporary artists are copying 20th century artists. And they are congratulated for it!!! Somehow to copy a "modern" artist is more "original" because it's a "modern" voice - which must be inherently more genuine. Apart from the faulty logic here, I frankly can't say I care whether or not someone wants to copy Otto Dix, and whether or not a critic likes it, but quite simply, why this double standard? 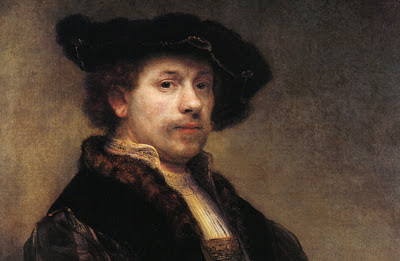 Why is it not acceptable to be influenced by Rembrandt? 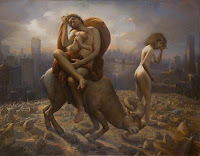 (As an aside note, an honest look at either Odd Nerdrum's paintings and my paintings will tell you that we are not copying Remrandt, but simply influenced by him. And it's evident that I'm not copying Odd, but deeply influenced by him. You can just as clearly see the influence of Hammershoi, Vermeer, Andrew Wyeth, and Goya.) So, the real question is: why reject the Greco-Roman tradition? But, you see, this zeitgeist idea is also a false illusion. Obviously my zeitgeist is different from Koons'. 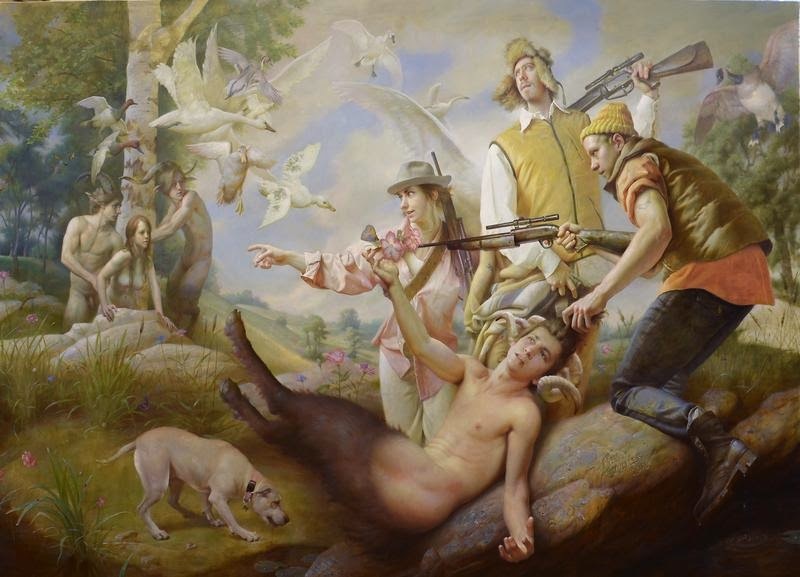 And Ai Wei Wei's zeitgeist is different from Lucien Freud, who's zeitgeist is different from Andrew Wyeth, who's zeitgeist is different from, though related to Odd Nerdrum's zeitgeist. So, exactly how many zeitgeists are there? So, again. What we're really debating here is Plato vs. Aristotle vs. the Sophists. Kant vs. Hume vs. Hegel... and dozens of other incarnations of the same. If you look at philosophy, all philosophers are more or less regurgitating either Plato or Aristotle (or in the case of the German Idealists like Hegel, they regurgitate the sophists). I, for one, can't see any progress, only a wheel on a treadmill. " Would you like me to write more? Support me on Patreon! Become a Patron! Please note that all content provided on this site is free of charge. 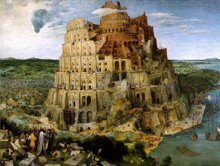 If you have arrived here through payment to a third party, be aware that Art Babel is not affiliated with any source which requests monetary compensation for the content herein. Please include a brief artist statement.